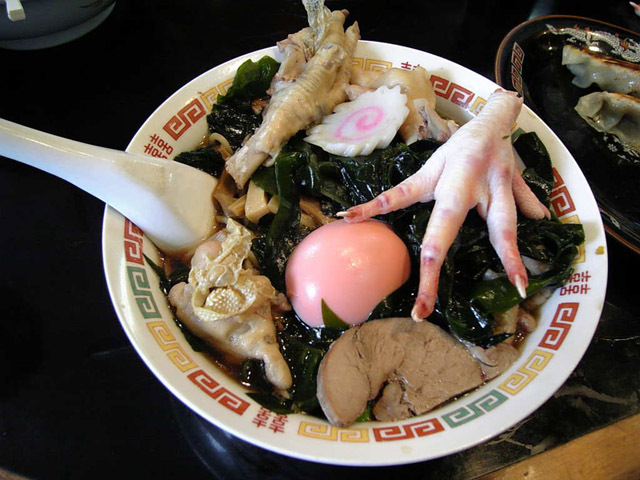 Delicious bowl of Ramen, love the chicken feet touch! Let me teach you a little trick that might come in handy for foreigners in Japan. Say that a Japanese person that you know, but don't particularly enjoy talking with, invites you out for lunch (reasons for not wanting to talk could be anything ranging from English Vampires, co-workers that you don't really have anything to talk about outside work or generally people you don't want to spend more than necessary time with) and you feel that you can't make up an excuse or decline. It's almost inevitable that the Japanese person will ask you what you want to eat and you should answer "I'd love some Ramen noodles!". With almost 100% guarantee the person will enthusiastically agree to your suggestion as I've after ten years in Japan have yet to meet a Japanese person who straight up dislike Ramen. You might get dragged into a conversation about which soup base you prefer but just try to stay out of it with a general comment like "I like them all so you pick one in a place close from here". The geniality with this strategy is that when a bowl of Ramen is put in front of a Japanese person he/she/it will inevitably cease all conversation and focus on eating the Ramen soup, fast and methodically, without talking until the bowl is finished. If it's a popular place there might even be people waiting for a seat allowing you to eat yours more slowly as your lunch partner would be forced to leave the seat for another hungry patron as soon as he/she/it finishes up. If there is no line of people waiting you have two options. 2. You eat as fast a you can and if the lunch partner finishes before you and tries to initiate a conversation while you still have food left you should focus on eating the food just nodding and grunting for replies while eating. This would not be considered as rude as they would relate to the focus on the Ramen and not conversation. After being seated and ordering a regular Ramen bowl you should have it in front of you within minutes, minimizing any longer unwanted pre-food arrival conversation. However it is of utmost importance that you refrain from ordering anything from the side-dish menu apart from the regular Ramen (gyoza, fried rice etc.) as the rules of Ramen eating would no longer apply as strictly and conversation tries might be initiated. Note: This does not work with Udon noodles or Soba noodles so do do not felt tempted to try! Sage advice for the city life. The chicken feet are makin' my mouth water! I walked into a ramen shop in Waikiki and was so put off by the deafining slurping sounds that I immediately exited. I have never been to a ramen shop in Japan in 6 years and never will. That experience in Hawaii is stuck. Hush: Willin' to bet you a bowl of gizzards that they done took the sheaths off before a' cookin'. Yep. Just how is one supposed to eat the chicken feet? How do Japanese ppl eat ramen so fast? It's scary. Will - Indeed, I wonder why it's not stardard with the chicken feet in the ramen? Kathrynoh - Yeah, the speed that some people do it with is quite amazing! Is this common knowlege or is it something you came up with yourself? Hilarious and oh so true.